We evaluated water quality and fish assemblages in deep (>3.0 m; N = 7) and shallow (<1.5 m; N = 6) floodplain lakes in the intensively cultivated Yazoo River Basin (Mississippi, USA) using indirect gradient multivariate procedures. Shallow lakes displayed wide diel oxygen fluctuations, some reaching hypoxic/anoxic conditions for extended periods of time, high suspended solids, and extreme water temperatures. Conversely, deeper lakes were represented by higher visibility, stable oxygen levels, and cooler water temperatures. Fish assemblages in shallow lakes were dominated by tolerant, small-bodied fishes and those able to breathe atmospheric oxygen. Deeper lakes had a greater representation of predators and other large-bodied fishes. Our evaluation suggests fish assemblages are reflective of oxbow lakes water quality, which is shaped by depth. 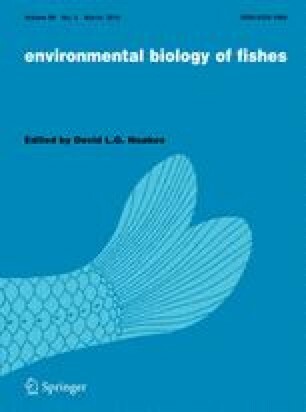 Understanding the interactions between depth, water quality, and fish assemblages may facilitate development of effective management plans for improving conditions necessary to sustain diverse fish assemblages in agriculturally dominated basins. We thank the Mississippi Agricultural Forestry Experiment Station, U.S. Geological Survey, U.S. Army Corps of Engineers, and the Forest and Wildlife Research Center for their support. We also thank Seiji Miyazono and Brian Henning for their constructive reviews. Specimen collections were authorized under Mississippi State University’s Institutional Animal Care and Use Committee protocol number 08–034. Any use of trade, firm, or product names is for descriptive purposes only and does not imply endorsement by the U.S. Government.